Using the Splashtop app, you can use all your programs, work with files, browse the web, watch a video, or listen to music from your remote computer. However, if you want to delete Splashtop Streamer from your Mac, read on the article. Today, we will share with you three methods of uninstalling Splashtop Streamer on a Mac completely and safely. Remove Splashtop Using Its Uninstaller. Uninstall Splashtop Streamer Using App Cleaner & Uninstaller. Open the Applications folder. 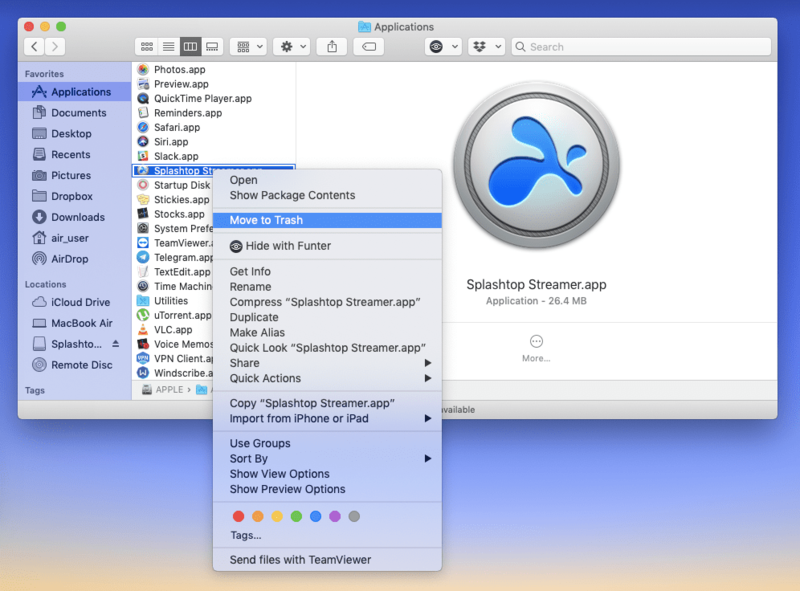 Choose SplashtopStreamer.app and select Move to Trash from the context menu. Then empty the Trash bin to entirely remove the Splashtop Streamer app from your Mac. If you wish to save time and want to be sure that you have removed all the Splashtop Streamer remaining files, use its native uninstaller. You can find it in the Splashtop Streamer dmg (installation image disk) file. Just open this dmg file and double-click on Uninstall Splashtop Streamer.app. In less than a minute the application will be removed completely. 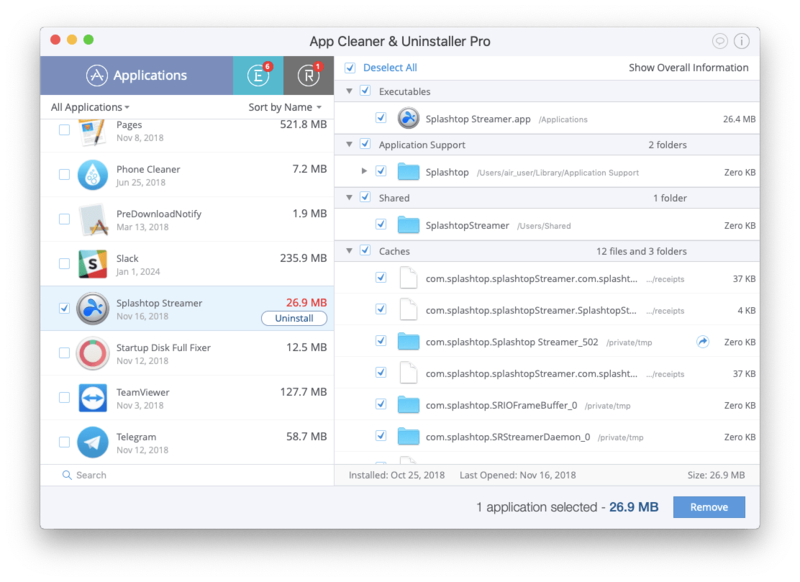 If for any reason you cannot find or use the Splashtop Streamer uninstaller, we recommend using a third-party program like App Cleaner & Uninstaller. Read on to learn more about it. Select Splashtop Streamer from the Applications tab and click Uninstall. All its useless service files will be selected automatically. Overview the files you want to delete and confirm the action by clicking on Remove. 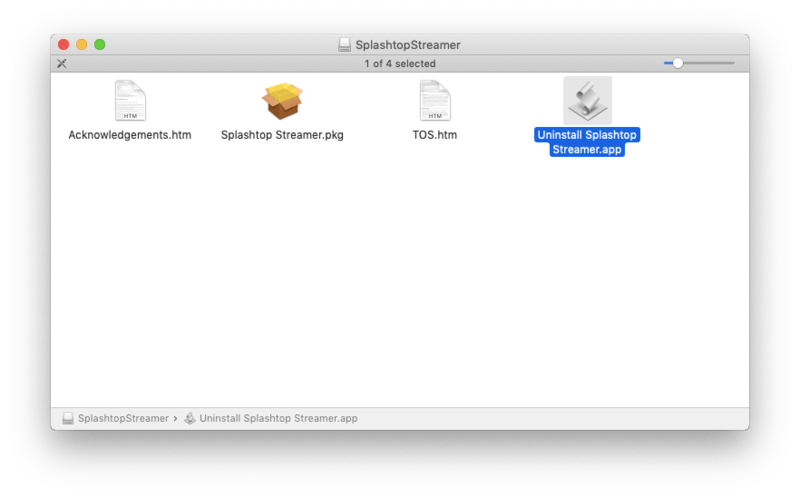 Empty the Trash to complete the Splashtop Streamer uninstallation on your Mac. Besides that, you can find leftover files of previously-deleted apps on your Mac. For this, open the Remains tab of the App Cleaner & Uninstaller software → select the items you want to delete and click on Remove. Then empty the Trash. Sometimes we need to delete several applications at once, and using the manual method of uninstalling seems tedious. To make it worse, you can miss some of the apps’ service files. While using an app’s native uninstaller is always a good idea, not all native uninstallers remove applications completely. 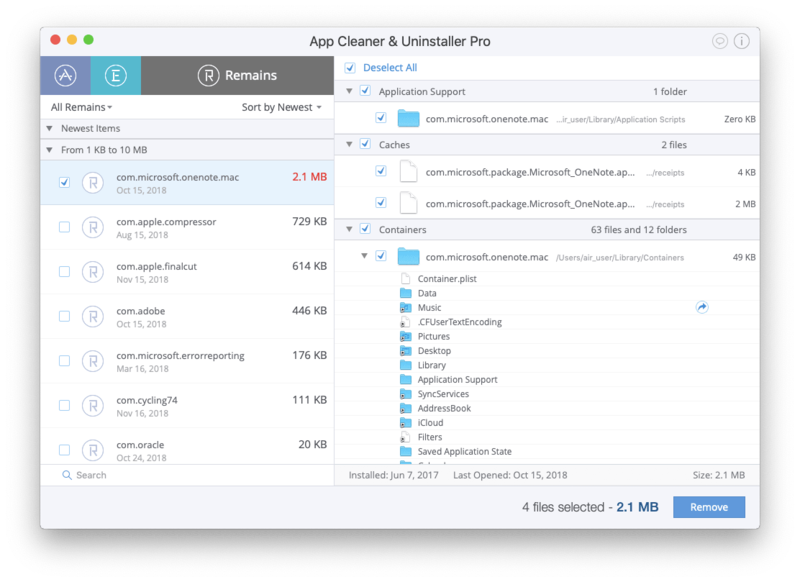 When you need to delete apps completely, the number one recommendation is to use a special tool for this task – App Cleaner & Uninstaller. 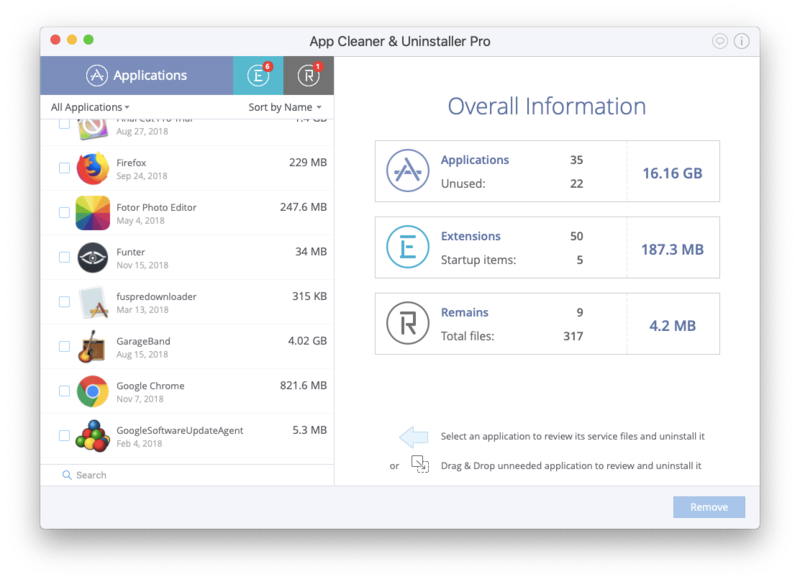 App Cleaner & Uninstaller helps to delete applications and their service files correctly, entirely and with just a few clicks. You can download its free trial and start using it right now.